As we have discussed in detail recently, the VA Loan program is the best option for veterans of the United States Military to purchase a home with minimal guidelines and little if any money out of pocket. As of this writing, there have been over 22 million loans closed using the VA Loan program which includes current military members and also qualified former members of the military that have their COE or Certificate of Eligibility. Now there is a loan option under VA Loans that we are going to discuss today that does not get the attention it deserves and it is the 2017 VA Cash Out Refinance. Just like other cash-out refinance options, the VA option is no different and allows veterans to tap into the equity in their homes when they need to. 2017 VA Cash Out Refinance: What Is It? As previously mentioned, the 2017 VA Cash Out Refinance is just like other cash-out refinance options except it is a loan under the VA umbrella of loans. You are still required to be a veteran of the military and with proper eligibility requirements like standard purchase loans. The 2017 VA Cash Out Refinance is 1 of 3 loans offered by the VA with the others being a VA Loan Purchase and a VA Streamline Refinance (also known as an IRRRL or Interest Rate Reduction Refinancing Loan). With the 2017 VA Cash Out Refinance you are able to receive cash back upon closing of the loan from your equity and you are able to refinance a non-VA Loan. This is one great requirement as you do not need a VA Loan to cash-out but can have an FHA or Conventional Loan as well and refinance no problem. With a VA Cash-Out you are able to borrow up to 100% of the home’s value and receive the proceeds minus applicable closing costs. For example, if you have a home worth $250,000 and you owe $175,000 on it, you are able to cash-out $75,000 minus any closing costs associated with this loan. The requirements needed for a 2017 VA Cash Out Refinance are similar to those needed for a VA purchase loan. The main items you will need is a new appraisal of your home to support the value and cash-out amount you are wanting, current paystubs, W2s, tax returns, etc. If you don’t want to deal with all the paperwork and you already have a VA Loan, you may want to choose a VA Streamline Refinance as an appraisal and income documentation is not a requirement. As with all VA Loans, making sure you are eligible is key to even seeing if you can get approved. To be eligible you will need to have one of the following: Served 90 days during wartime, served 90 days and still on active duty, served 181 days during peacetime, served 6 years in National Guard or Reserves, or a surviving spouse. If you have made sure you are eligible for a loan, then the next thing you should know are the 2017 VA Loan Limits which like all of the other loan programs has seen increases for the 2017 year. The standard 1-unit VA Loan limit for most areas is going to be $424,100 while the high cost areas can have a limit as high as $721,050. You are also able to cash-out refinance more than the loan limits if you follow these parameters. Let’s say the loan limit in your area is $424,100 and you want to cash-out refinance for $574,100, all you need to do is retain 25% of the overage in home equity to qualify for the loan and in this case if would be 25% of $150,000 or $37,500. 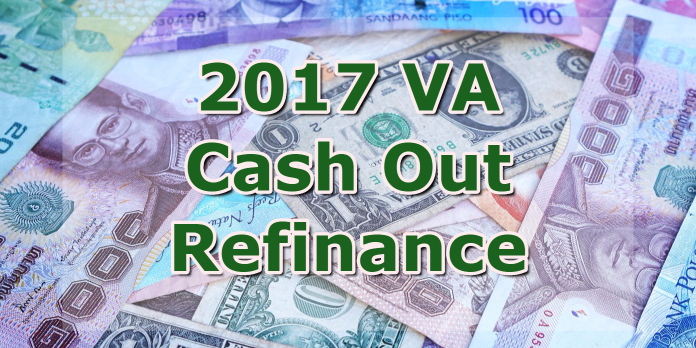 2017 VA Cash Out Refinance: Call Today! If you are a veteran and are currently not using your VA Loan or you would like to perform a 2017 VA Cash Out Refinance, then you need to call us today at 888-900-1020 as we love nothing more than helping veterans of the military become home owners and help them in any way that we can. The VA Loan program is the most lenient option around, so if you have your COE or Certificate of Eligibility then you need to hurry and call today as you could be wasting money on a monthly basis having a loan your are paying mortgage insurance on as well as a higher mortgage rate. Let’s get you in the right loan and a loan you deserve and have earned. The Department of Veteran Affairs has a great program in place to help out Veterans and there really is no excuse not to get into a great loan program for you. We have lenders that will get you an approval with a 580 FICO score and no requirements on debt to income ratio. If you think this is too good to be true, then you need to call us today or email us at contact@loanconsultants.org today and we can go over your scenario immediately.